Who says a sit stand workstation can't look good as well? In their debut entry into the fast-growing desktop riser category, the QuickStand oozes with Humanscale's trademark modern design aesthetic, making it the best choice for office environments that covet high architectural design. Form follows function with a very elegant internal monitor cable routing scheme and a strong desk clamp that attaches to the rear edge of the desk - fully adjustable for varying tabletop depths. As you would expect at this end of the price range the monitor and keyboard heights are independently adjustable. However, while the monitor position is held stiffly, the keyboard position is not. Lacking a quick-release brake there is a tendency for the entire keyboard platform to move downwards with heavy pounding on the keyboard. Tension settings can be set to overcome this to some degree, but not entirely. This is a gorgeous product that gets the job done, but at this price we think the QuickStand should have a quick-release brake on the keyboard platform adjustment to make it perfect. A couple of minor design tweaks would earn this product a 5-star rating from our desktop riser expert review team, but we can wholeheartedly recommend it for those users who are willing to pay a little more for a clean, modern look that won't clash with the elegance of their desk or office. Sleek, modern aesthetic. Clearly the "looker" of the bunch when compared to any other desktop riser model. Depth-adjustable worksurface not found in most desktop risers. Built-in cable harness means you're not tangling with a jungle of cords. Very quick and easy keyboard height adjustment. 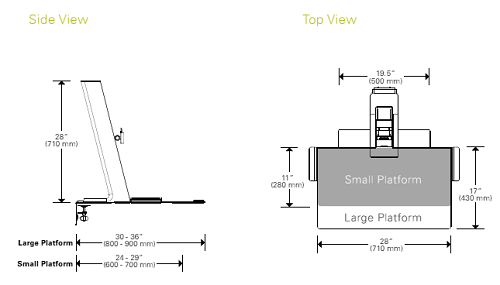 Compared to other desktop risers that cost less, the QuickStand has less lifting capacity. The lack of a quick-release brake on the keyboard platform and the way the platform "floats" 1/4 inch above the desktop at the user edge when in the seated position was annoying to some testers. Overly stiff monitor height adjustment. With the Quickstand, Humanscale has once again brought their signature aesthetic to the office fitness marketplace. With a sleek, Apple-worthy aesthetic and seamless wire management system, the Quickstand brings a touch of elegance to your home or office. While it does lack much of the adjustability and strength of other sit stand workstations, it is undeniably a compelling addition to any aesthetic-focused workplace. Humanscale, long-time makers of keyboard trays, monitor arms, and the Float Table, have introduced their contender in the growing sit stand workstation industry: the QuickStand. A late entry in the fight for office desk dominance, can the QuickStand go toe-to-toe with veterans like the Kangaroo Pro and Ergotron Workfit-S? Our team of experts puts the new riser to the test, in our firsthand account of Humanscale's first contender. The QuickStand sit stand workstation consists of a single column resting on a flat thin base. The base secures to the tabletop with a two-piece clamp that can either be attached at the back edge of the desk or through a grommet hole. This clamp can accommodate tabletop thicknesses of ½" to 2 ¾". It's easy to install, and doesn't require any tools. platform, and one for dual-monitor use. Check out the Specs tab above for a detailed comparison of the three variants. The QuickStand is designed to be used with desks of different depths – anywhere from 24 to 36 inches. The work surface of the large platform QuickStand model is 28 inches wide – as wide as the Kangaroo, though not as deep. Either way, the QuickStand beats the Workfit-S’ 23" x 15" worksurface. But How Much Can it Lift? In terms of adjustment range, the QuickStand stacks up pretty evenly against both the Workfit-S and the Kangaroo Pro with its 5 inches of independent monitor adjustment and 23” of total height adjustment. What is significant is that the QuickStand is a lightweight compared to its competitors. It can only carry monitors up to 11 lbs. and has a maximum weight capacity of 25 lbs. The QuickStand won’t be replacing, just complementing your table top, so that weight limit probably won’t be an issue for most users. Nevertheless, the QuickStand’s weight capacity doesn’t hold a candle to the Workfit-S’ 16-lb. monitor weight capacity or the herculean 34 lbs. that the Kangaroo can be made to accommodate. Other salient differences include the inability to pan the monitor side to side on the single-monitor QuickStand (the Kangaroo Pro’s monitor has a 90-degree pan) and a smaller monitor tilt range. Additionally, the monitor tilt joint on our demo unit seems a little sticky, and isn't quite as easily manipulable as the utilitarian-styled Kangaroo. The QuickStand’s construction is similar to that of the Workfit-S, except that the keyboard surface is embedded with the work platform as opposed to the Workfit-S's suspended keyboard tray. While the Quickstand still demonstrates a small amount of wobbling, it is just as sturdy as the Workfit-S, if not a little sturdier. That said, it doesn't quite have the rock solid surface the Kangaroo offers with its clever if inelegant stabilization leg. The QuickStand also attaches to the back of the table rather than the front, as the Workfit-S does. This gives users easy access to their table top, and relegates the Quickstand's bulky column to the back, rather than smack dab in the middle of the desk. The downside to this is that, unlike with the Workfit-S, users can’t lower their typing surface below the table. From an ergonomic standpoint this is less than ideal, and as a long-time manufacturer of highly-articulating under-desk keyboard trays, we're a bit surprised to see this crucial ergonomic accommodation left out in Humanscale's design. Inside view of the QuickStand's cable harness. The QuickStand sports a couple of new features that have impressed our review team. One of them is its built-in cable harness, which contains and secures the monitor’s power cord, monitor cables, and USB outlets that many monitors now feature. The cable harness keeps the usual tangle of cords visually hidden, running cables from the monitor and other devices into the Quickstand's column and out the back, keeping your workstation as tidy as can be. The QuickStand also boasts the ability to adjust the depth of the work surface, a feature we don't see on most other risers. However, this feature isn't as user-friendly as the pictures suggest: during installation, you set the depth of the Quickstand by setting it on its back and attaching the base clamp to the worksurface along a rail using set screws underneath. We would've preferred the ability to just slide the Quickstand along that rail, but this method can at least keep the worksurface flush with the edge of the desk. 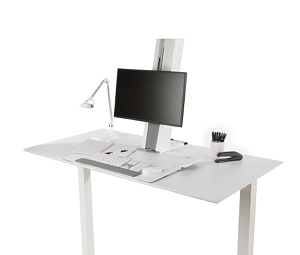 Its adjustable depth beats out the Workfit-S, but can be replicated by the Kangaroo, another sit stand workstation which can easily be slid along the tabletop towards and away from the user. This product would surely earn a 5-star rating from our expert review team, were it not for a couple of slightly annoying shortcomings. Unlike risers like the VariDesk, Kangaroo, One-Touch and most others, the QuickStand's keyboard platform does not have a quick-release brake. We've tried setting the tension on the platform height to the maximum but were still able to get the platform to skotch downwards by heavily pounding on the keyboard. In contrast, the monitor height adjustment is perhaps overly stiff. People come in all shapes and sizes, and many experience a noticeably greater height difference between keyboard and monitor when standing versus sitting. For them the stiff adjustment on the monitor height might be a slight annoyance. We've already mentioned how the QuickStand's keyboard tray does not descend below the tabletop, which is a common ergonomic shortcoming in many of the popular desktop risers on the market now. The thickness of the QuickStand's keyboard platform is only a quarter of an inch, so you would think that it would not significantly raise the height of your keyboard when seated. However, when lowered to sitting position it does not lay flat against the desk. The front edge of the keyboard platform actually sits more than a quarter inch above the desk, floating in the air. The platform being made of a springy substrate this results in more than a little bit of vertical travel when applying pressure down on the keyboard. Some users found this disconcerting and impacting their typing performance; others were less bothered by it or kept enough pressure down on the cushy integrated wrist rest while typing that they did not experience this issue at all. This issue is therefore a subjective one. Lastly, while Humanscale is well known for their white and stainless steel aesthetic, we found the white keyboard platform to be a little hard to keep clean. Most desktop risers use black platforms, perhaps for this reason. White's nice, no question, but the finish on the substrate used in the QuickStand's platform takes a little more effort to keep clean. Among desktop risers, Ergotron’s Workfit-S and ErgoDesktop’s Kangaroo have stood at the head of the pack in terms of functionality and adjustability. 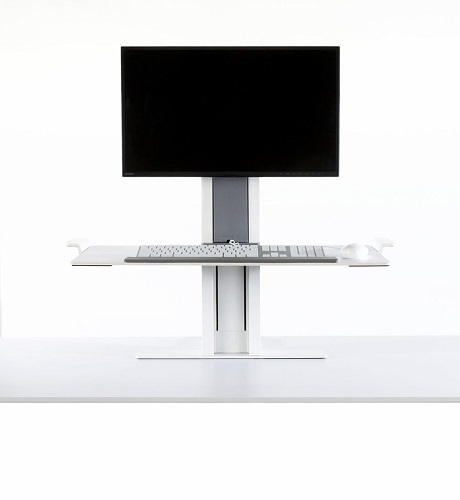 While Humanscale’s QuickStand doesn’t necessarily surpass the stellar performance of these two desktop kings (and in weight capacity is a bit shy in comparison), it does offer some unique features of its own. The ability to adjust the worksurface’s depth, and the convenient, built-in cable harness both introduce fresh ideas to the desktop riser market that we’d love to see become industry standards. The cost of innovation starts at a steep $829– more than the cost of either a Workfit-S heavy duty or a Kangaroo Pro – for the smaller light model. Humanscale has had a decades-long reputation for building high-quality products, and our findings at the testing labs suggest that the Quickstand is built in the same vein. While the premium price tag might turn some users off, anyone looking for a riser with a clean aesthetic and sleek functionality would be remiss to dismiss the Quickstand. It has already found widespread popularity in many professional services firms, design firms and other office environments where architecture and design get full consideration - and commensurate budgets - right out of the gate. You better fit what ever model they use. As mentioned in the article the monitor high is not very adjustable and the keyboard tray is not. I am 6’4 and it failed to adjust comfortably. For that price it should be a better product.